Before opening or closing the sunroof, open the sunshade (refer to the following page for instructions on how to use the sunshade). 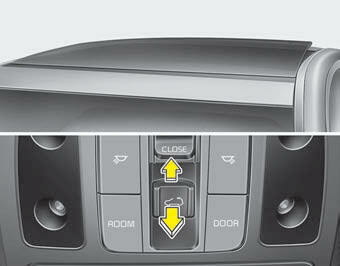 - Push the sunroof glass control lever upward. When you push the sunroof glass control lever forward or pull it downward while the sunshade opened, the sunshade will be closed halfway and then glass will be tilt down and then sunshade will be fully closed finally. When you push the sunroof glass control lever forward or pull it downward while the sunshade opened, the glass will be tilt down. Be careful that no head, hands and body parts are obstructed by a closing sunroof. Do not extend the face, neck, arms or body outside the sunroof while driving. Make sure your hands and head are safely out of the way before closing a sunroof. Do not leave the sunshade closed while the sunroof is opened.